Paint closets white and use a satin finish. Closets take time to paint so you only want to paint them once! Paint them white and they will look clean and colour matched with every room. When you open them up, you see into them better if they are painted white. Benjamin Moore Aura Satin Finish Product line 526 is a great choice for tim, doors and closets. Satin finish looks great for years and will withstand the beating of clothes hangers, shoes being tossed in, junk whatever. Asuming you have white trim throughout your house... I usually choose the same white trim paint for the closets. I do not choose to use cheaper paint for closets because they take more beating than most rooms in a house. If you are building a new house and you have a choice in the drywall finish, never get talked into textured closet walls. Textured closets never look or last as long as smooth closet walls. Textured walls in closets are rough in finish and are impossible to patch without notice should you bang the wall. 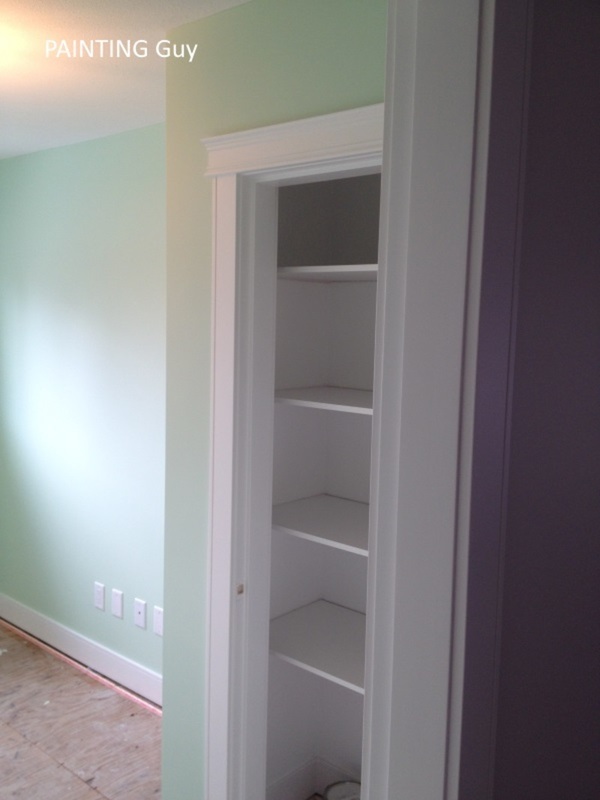 Drywall contractors like texturing closets because it saves them time. Never texture closets if you can help it. Smooth closet walls are best.